California is once again taking a global leadership role, doubling down on its commitment to build a clean, green transportation system in a second round of funding. In response to Executive Order B-48-18 issued by Gov. Brown in January, the California Energy Commission (“CEC”) has allocated $92 million in funding support for an additional 40+ hydrogen refueling stations as part of its 2018-2019 Investment Plan Update for the Alternative and Renewable Fuel and Vehicle Technology (“ARFVT”) program. Under the plan, an additional $17.5 million is allocated to advanced freight and fleet vehicles, and $25 million to low-carbon fuel production and supply, which includes renewable hydrogen production via electrolysis. Finally, an additional $134.5 million is allocated to further development of our EV charging infrastructure. At a May 14th workshop, CEC Hydrogen Director Jean Baronas acknowledged the strong correlation between the availability of reliable fueling infrastructure and consumer acceptance of fuel cell vehicles (“FCEVs”). Currently, there are 34 open retail hydrogen stations refueling over 4,200 FCEVs, with drivers unable to reach certain areas due to gaps in station coverage along major transportation corridors. With strategic placement of 40+ stations, more drivers will be able to reliably travel anywhere within California. Funds allocated for freight/fleet vehicles are similarly critical, as medium and heavy-duty FCEVs will relieve high pollution levels at ports, industrial centers, and along freeways, areas in which adjacent low-income families unjustly suffer from concentrations of unhealthy fine particulate (PM4) emissions. Furthermore, successful deployment will create opportunities to provide consumers more vehicle choices. Let’s face the facts: most Americans aren’t interested in driving compact sedans and are looking to purchase SUVs, minivans, trucks, RVs, and other large-capacity vehicles. Until a range of choices materializes, consumer adoption will be constrained. 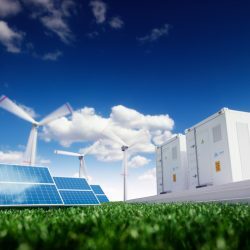 For those interested in creating carbon-free infrastructure based on a hydrogen economy, the fates of the power and transportation sectors are inextricably linked. Without aggregate demand, achieving price reductions through economies of scale will be extremely difficult, and the failure to utilize excess grid energy to produce renewable hydrogen will result in curtailed (wasted) energy and dampen renewable development. All these elements must move forward in concert. The CEC will be holding a series of workshops to articulate a strategy to transition to a new energy economy that eliminates all significant environmental impacts. Issues to be discussed include (i) reduction in station construction and operating costs; (ii) optimal siting of stations to maximize network performance, consumer mobility and reliable refueling; (iii) streamlined administration, local planning, and permitting; and (iv) developing a renewable hydrogen production and delivery network. In all these areas, the Academy has developed strategies to effectively achieve these goals. I will be actively participating in this process over the summer on behalf of the Academy and will post my comments and observations online. I also welcome any outside perspectives, so please feel free email me your thoughts on this incredibly important issue. Together, we can help move California, and ultimately the world, to the biggest paradigm shift since the Industrial Revolution.